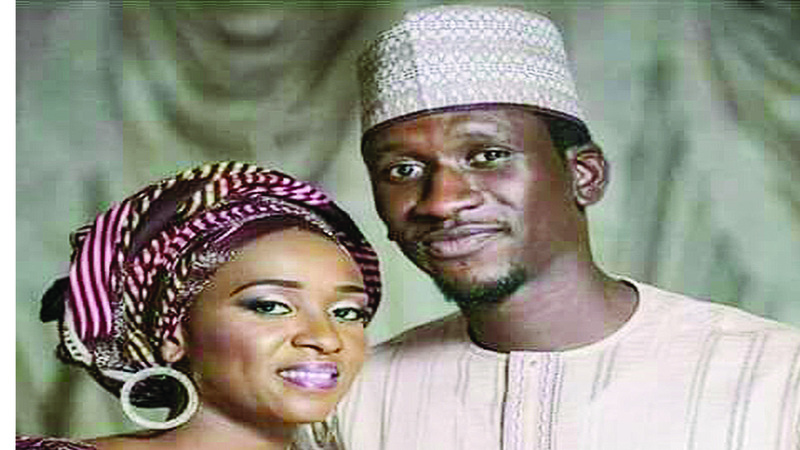 Maryam Sanda and her late husband, Bilyamin Muhammed Bello before she allegedly stabbed him to death. Maryam Sanda, who is accused of killing her husband, Bilyamin Bello, on Monday begged an Abuja High Court sitting at Jabi, to grant her bail because she was three months pregnant. Sanda, who was remanded in the Suleja prison, Niger State in November 2017, was alleged to have stabbed to the death Bilyaminu, son of erstwhile PDP Chairman, Dr Haliru Bello. She was arraigned on an amendment charge before the court alongside her mother, Mrs Maimuna Aliyu, her brother, Aliyu and one Sadiya Aminu for culpable homicide and conspiracy. At the resumed hearing, Sanda told the court through her counsel, Joseph Daudu (SAN) that she was three months old pregnant, hence, bail was necessary. Daudu told the court that a new application praying for the bail of the defendant was filed on Jan.26. “We have disclosed 16 grounds on which the application is premise, it is supported by 19 paragraph affidavit and written address. “’We have attached exhibit particularly exhibit A, the medical report, confirming the present position of the defendant, we rely on all the document,” he said. According to Daudu, the new intervening fact is that the applicant was three months pregnant and that a test has been carried out to confirm the pregnancy. He argued that it was not proper for a pregnant woman to be standing trial while in incarceration. Daudu assured the court that if granted bail, his client would attend her trial. “Apart from the issue of blood pressure, issue of dizziness, pregnancy is a thing that comes with complicated issue. “I have not seen any reference in my own experience where a woman who is pregnant is denied bail, the court should use it discretion and grant the defendant bail in the overall interest of justice,” Daudu stressed. According to Daudu,there is no way hearing can go on on the matter when there is no proper charge before the court and that the charge before the court is based on the information the prosecution gathered. He added that this matter has not been sent to the Department of Public Prosecution (DPP) for advice and that there was need for that before could proceed. In his arguments, Mr James Idachaba, told the court that the prosecution had filed a counter affidavit and written address against the bail application. “’On our part, this kind of application is premise on Section 161 of the Administration of Criminal Justice Act(ACJA), it is for the applicant to convince the court to warrant the granting of bail in the applicant favour. “There is no authority to fall back to that a pregnant woman standing can be granted bail on exceptional circumstances. “The fact presented before the court by the defence counsel was not sufficient, we urge the court to dismiss the application, section 161(1)(c) of the ACJA should be consider by the court,” he said. Idachaba added that it was too late for the defence to raise the grounds that the matter should have been sent to the DPP for advice. He said that the defence counsel should have raised the idea of taking the case file to the DPP earlier, adding that what is before the court is regular and proper. “We came before the court as of right, criminal trial can begin either by information or charge,what is before court is clear. “We have complied with all requirement of the law, Section 221 of the ACJA should be look into, they have already taken plea in this matter, we order that this matter commence, ” Idachaba said. Justice Yusuf Halilu, adjourned untill Wednesday to rule on the bail application.